Click above to download and print handouts on résumés, cover letters, and more! Whether you’re searching for a job or internship, or just looking to schedule an appointment with your career consultant, Handshake is Pitt’s comprehensive career management database. Borrow professional attire for free at the Career Center! Click here to contact our office to schedule an appointment. University of Pittsburgh students can receive an exclusive discount on test preparation programs through the Princeton Review. A comprehensive resource for exploring the connection between academic majors and potential career fields. The University of Pittsburgh’s LinkedIn group is dedicated to improving the career prospects of fellow Pitt alumni and students. Pitt’s online destination for international job and internship search strategies as well as career resources for more than 75 countries. Career tools designed to help you assess your career interests and options. Get involved, gain a competitive edge with employers and graduate schools, and take advantage of all that Pitt offers. Familiarize yourself with these tips for spotting job or internship postings online that are not legitimate employers and could end up costing you time or money. The Career Center offers career services to all current Pitt students and recent alumni. Career Consultants assist with all phases of career development, from choosing a major to getting an internship, to beginning your job search, applying to grad school, salary negotiation, and more. They provide career assessments, résumé and cover letter writing assistance, and mock interviews. If you’re interested in the Internship Guarantee program, our Internship Team will be happy to meet with you. Our employment team hosts our large scale career fairs and on-site recruiting opportunities. Our office conducts various classroom presentations, workshops, and large scale events to allow each student to get the tailored service they need to be successful. You are able to meet one-on-one with our Career Consultants for quick drop-in meetings and longer appointments (scheduled through Handshake). Do I need an appointment to visit the Career Center? Students are welcome to stop by Monday-Friday from 10am-4pm. Staff will be available for assistance for short 20 minute drop-in appointments. If you'd like to schedule a longer appointment, students are encouraged to schedule with their Career Consultant on Handshake. What kind of career assessments do you offer? We have a variety of career exploration resources. Career assessments are not the final answer to finding your career, but they do generate information and ideas that can be useful pieces in the career decision-making process. In order to complete one of our assessments like the MBTI or Strong Interest Inventory, please make an appointment with your Career Consultant through Handshake. We can assist in all realms of the job search process from providing job posting resources on Handshake, to résumé and cover letter writing, to networking basics, to mock interviews. This does not guarantee you will get a job, but will provide you all the necessary tools to help make that process more successful. Can I use careers services if I've already graduated? Yes! Alumni are welcome to use our resources and services. Please click here to learn more. Our office primarily serves students and alumni so we refer to the series of events the University of Pittsburgh Office of Human Resources hosts each year or can provide a referral to an external career counselor. As an employer, how do I post a job? 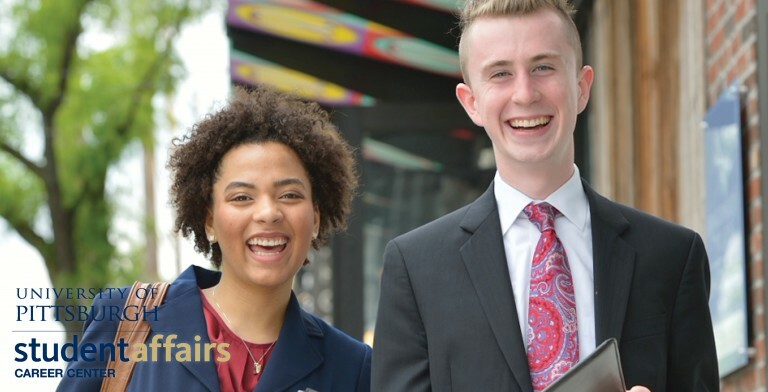 The Career Center is happy to help employers connect with University of Pittsburgh students and alumni by offering various job posting options free of charge through our platform Handshake. Please follow this link to set up an Handshake account.